What Is The Definition Of Throw-In In Soccer? 1. This is a phrase that describes a method of restarting play after the ball has exited the field of play through either side of the field. The team who did not touch the ball last is the team that is awarded the throw-in to restart play. 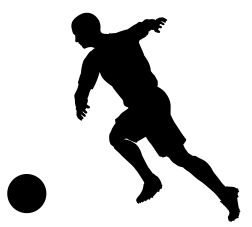 The throw-in location is the spot where the ball exited touch-line, or side-line. The proper form of throwing-in the ball, is to first have both feet standing behind the touch-line that is out-of-play. Then the player holding the ball, must lift the ball over their heads with both hands and then throw the ball back into play, resuming the match. The opponent may stand in front of the player who is throwing-in the ball, but may not stand any closer than two meters. 1. Donovan elects to take the throw-in and throws the ball in front of a streaking Beckham who dribbles the ball up to the penalty area and unleashes a strong kick that goes just wide of the net.